Yesterday morning, it happened: I got my first glimpse of autumn. It wasn’t the temperature, because DC was as steamy as ever. It was the quality of light outside when I woke up, just a little dimmer than the blazing sun of July mornings. It was something about the way air smelled. This happens every August–I catch a glimpse of the fall to come–and I greet it with a mixture of excitement and sadness, because while autumn is my favorite season by far, I also love summer, and I’m sorry to see it go. Especially since I’ve spent the last two summers in science lab, crunching numbers as the days fly by. 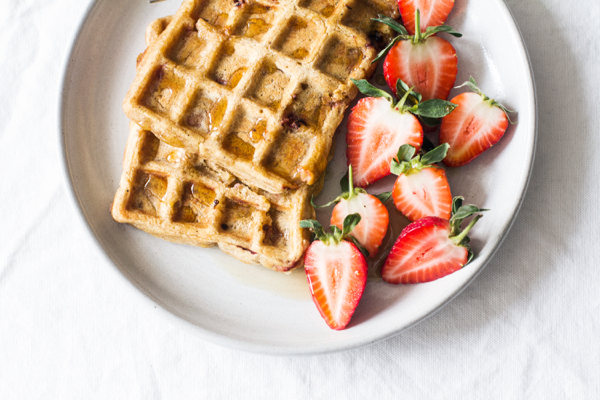 Think of these vegan, gluten free strawberry pumpkin waffles as the perfect crossover for summer and fall. If you, like me, greet the start of pumpkin season with glee, then this recipe is for you. But it also contains tiny pieces of chopped strawberry, which keep memories of summer alive. I know it sounds like a very odd combination, but I promise, it’s delicious. These waffles are fluffy and light, in part because of the gluten free flour and starch mixture. 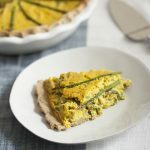 In place of it, you can use whole wheat pastry flour, spelt flour, or gluten-free all-purpose flour–all of which I bake with regularly. Special nod to Iris for help with this recipe, as her standard universal waffle and pancake template helped to inspire it. I still owe you guys a review of her fantastic GF baking ebook, but suffice is to say for now that it’s a tremendous resource for those of us who started off clueless about vegan and GF baking! Mix together wet ingredients (including pumpkin). Add wet ingredients to dry, mix well, and then fold in the strawberries. If you need to add some almond milk to make the batter appropriately thin, do so (it can vary from try to try). It should resemble any standard waffle or pancake batter, but maybe be slightly thicker. Spray a waffle iron with olive or vegetable oil spray and make waffles according to manufacturer instructions. I typically pour about ½ heaping cup of batter over the surface and wait till it’s cooked through. Be absolutely certain to spray the iron between each waffle to ensure the best results. 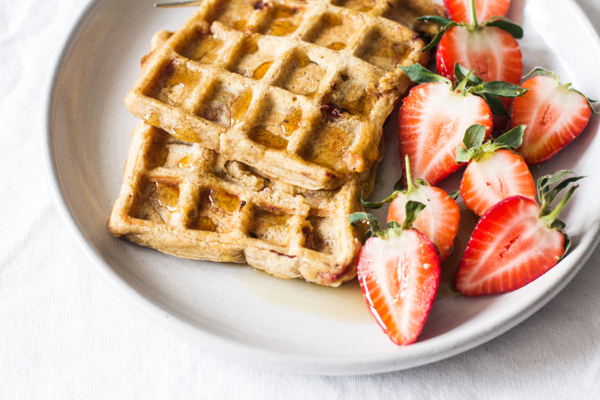 Serve the waffles with additional strawberries, if desired. In place of the flour and starch, you can use 1¾ cups all purpose flour, whole wheat pastry flour, or spelt flour. 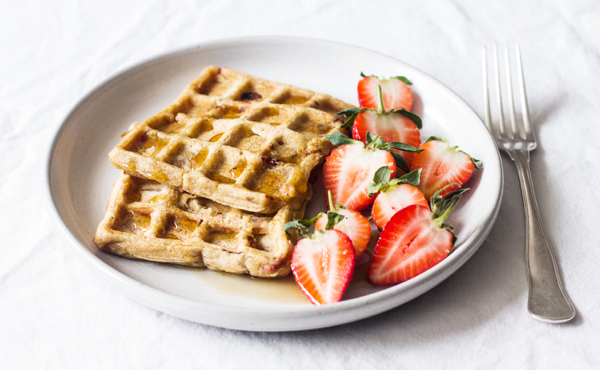 If you don’t have a waffle maker, you can turn this recipe into pancakes and cook accordingly; just be sure to cut the strawberries quite small. I hope you enjoy this delicious breakfast meal. Tomorrow, I have a new dip/spread recipe for you, and later this week, further thoughts on the “dedication vs. obsession” theme. Have a good Monday! 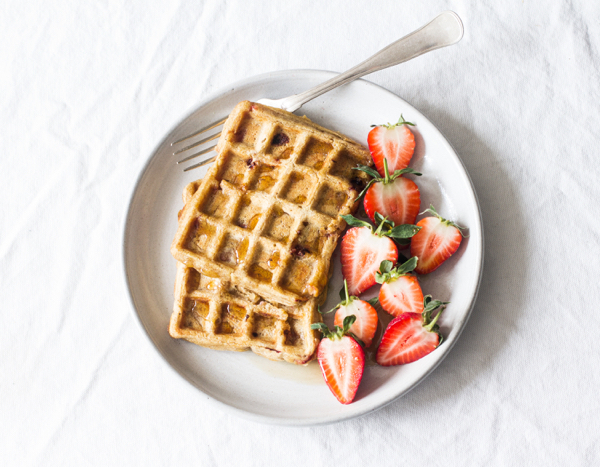 Gena you are on a roll with your recent breakfast-ey recipes and pumpkin + strawberry waffles — NICE!!!! It’s like you read my mind. I was just saying how much I’ve missed waffles. Haven’t been able to find a vegan and gluten free recipe without tons of added sugar. Can’t wait to try this out. Thank you! Oh my word… how amazing does this look! A million thank yous for a vegan AND gluten free recipe 🙂 can’t wait to try these next weekend… or maybe they’ll be dinner this week?? Great post. So i don’t have a waffle iron pan, can i turn this into a pancake recipe? Absolutely! Make sure to cut the strawberries small, though. These look so good! Haven’t had waffles or pancakes in forever!!! I am a huge fan of fall too, def my favorite season! This looks and sounds so damn good! Embarrassing enough, I haven’t had waffles in years! Gena, love you for this. Thanks for the shout out. These look soooo delicious! Thanks Gena! I like how there is no baking powder in this! yummers! Ay! You actually caught a typo I’m prone to: it’s baking powder indeed (not soda). Sorry!! I’m so torn! I am a fall girl. All-time favorite season. It could be that weather all year long. But I love the summer produce so much! I haunt the farmers markets every weekend day! So now I have to try your combo.Yum! Great mix. Mind you, it will have to be pancakes. If I buy one more appliance I think my husband will make me sleep outside. oh my gosh those are perfect! what a delicious combination! strawberries and pumpkin! yum!! i’ve noticed that its been getting darker a teensy bit earlier here in New York. 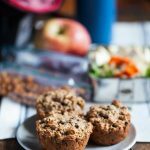 my favorite fall food is definitely anything involving pumpkin! its still so super hot that i’m ready for sweaters, scarves and boots! 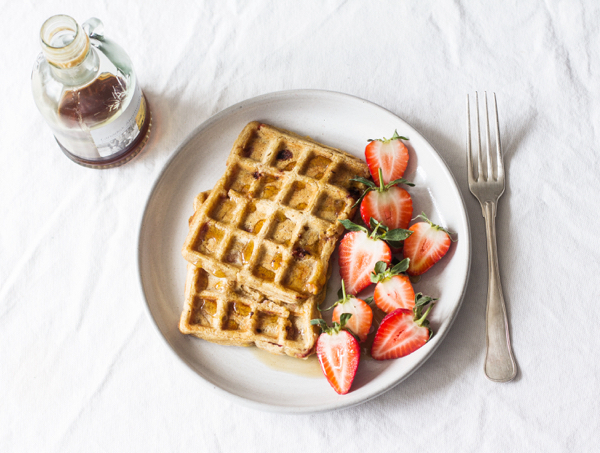 These looks terrific–love waffles as a nice change from pancakes once in a while (though I do love both. . . !). But please, NO talk of fall!!! You’ll make me cry. 😉 Enjoy every second in NYC! These look fantastic! And your not the only one who has been feeling fall! I had it hit me 3 days ago and today I caught myself looking at the trees for different colors lol. And then I came to my senses saying were not even mid August yet! Plus I have already started to dream up all things pumpkin so you have really stolen my taste buds on this one :). All I need is a waffle maker now! Here, in northern AZ, some of the trees actually have yellow patches! The nights have been unusually cool and feels very autumn like. I’ve been on a waffle kick for a couple months now, and those pictures have me salivating! Loving the addition of pumpkin, too. My partner and I have already planned a nice waffle breakfast for the morning. I am also a lover of autumn and can relate to your mixed emotions about the early signs of the change of seasons. While you were enduring the high temps, it got unseasonably cool here. When I took my dog for a walk it felt like an October morning. In my mind, I could already see him leaping joyfully through piles of colorful leaves. What a crazy feeling for the middle of August. Update: Tried these today and they are really good. The berries inside are sweet like jam, and they paired well with the pumpkin’s subtle earthiness. I’m definitely going to make these again. Thanks for the inventive recipe! Oh no please, please, I selfishly want it to stay hothothot, because I’ve just come from Australian winter and, before that, a dodgy summer of thunderstorms and cold and the occasional burning day. I want more of your glorious heat before Canada wraps me in cold! Though such glorious waffles as these would make the transition easier, yes indeed. I don’t know when I last had waffles! anything pumpkin right now is getting me so excited for fall. it can’t come quick enough! I cat wait to try these! Who would have thunk? Pumpkin and Strawberries! This waffle looks and sounds delicious. Can’t wait to try it! Oh my. I haven’t eaten waffles in such a long time and now I’m craving them! 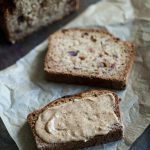 Thanks for this wonderfull recipe Gena! These were so good! I love pumpkin so much so when I saw these I knew I had to make them. They are very light and fluffy. And it works well with regular whole wheat flour in case anyone has asked!